I’m on such a losing streak. I’ve yet to win anything in Roll up the Rim. Nothing, not even a donut. This year each cup even has two rolls on it and I’m still skunked. It dawned on me this morning, as I rolled out of the drive-through, that this Roll up the Rim thing may be… it might be **whispers** gambling. You don’t say. A good Mennonite? Gambling? Well, if you think about it, a cup of coffee is almost the same price as a bet at the local horse races (that place of sin and debauchery). What is a Mennonite to do? Maybe I need help. Maybe I should buy coffee exclusively at McDonalds where I am at least guaranteed a sticker for my rewards card–a return on my investment. Perhaps that would be better stewardship of my God-given resources. Or maybe buying coffee at Tim's is too worldly all together! 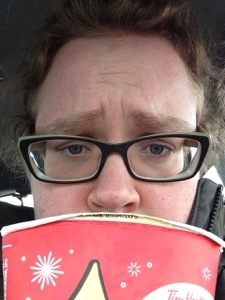 Never mind that NOT going to Timmies makes me un-Canadian or something. Mennonites don't really do the patriotism thing. Everyone knows that. Well, if I ever win the car, I will tithe once I sell it. I promise. That makes it okay, right? Right? You said YOU would sell the car. If I win, I have full intentions of keeping it. I also was thinking very logically today about how the $5000 prepaid Visa card might be invested… as I rolled up a losing rim. Ditto that! You were planning to consume coffee either way! I wonder if Tim Horton’s can track the changing tide like scientists can predict the ocean’s high tide? Would be interesting to visualize the tug of war between say Timmie’s & McDonald’s when it come to coffee sales. So why not take advantage of their marketing games?